Premixing is the addition of a 2 stroke oil (also known as 2 cycle or 2T oil) in to the fuel supply to aid with lubrication of the engine. In the case of the rotary engine this helps with lubrication of all the seals that are otherwise only lubricated via the oil injectors. These oil injectors are fed via the OMP (Oil Metering Pump) also referred to as the MOP (Metered Oil Pump) The OMP varies the amount of oil supplied to the oil injectors depending on engine load and RPM, however the OMP draws its oil supply from the oil in the engines sump. While this is considered sufficient my Mazda to lubricate the rotary engines varied selection of seals in reality, some feel that the oil injectors just can’t deliver enough oil in the right areas to help with sufficient lubrication. This is where premixing comes in. The use of a high quality 2T oil can benefit your engine in many ways other than simply providing additional lubrication. 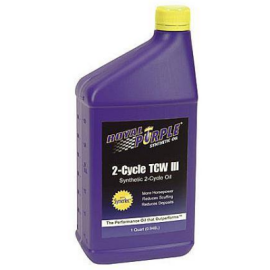 Royal Purple 2 Cycle oil Also known as HP-2C (High Performance 2 cycle) is engineered to provide superior lubrication with minimum ash deposits. while exhibiting an extremely high flashpoint of 99ºC, a Flashpoint that is considerably higher than many other premix oils on the market that are recommended for rotary engines. 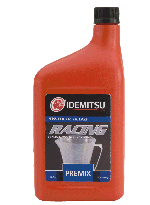 Idemitsu Racing Rotary Premix is considered by many to be the best premix available on the market for your rotary engine, whats great about this Premix is that it has been specifically engineered to me the unique requirements of a rotary engine. The Technology base for this formulation goes back to the first and only 24 Hour Le Mans Le Mans Race Winner using a rotary engine for which Idemitsu developed the winning oils. As a Comparison Idemitsu Racing Rotary Premix has possibly the highest flashpoint we have seen for a rotary engine premix of 126ºC. Improved sealing performance of rotary engine internal seals. Reduced friction on seals leading to reduced engine wear. How do I add my chosen Premix to my Engines Fuel? Using Premix like Royal Purple or Idemitsu is a simple process, simply pour the correct amount in to your fuel tank via the filler neck prior to filling up your car with petrol. No need to mix mix your 2T oil with a small amount of fuel first in a bottle (this is a question we get asked a lot) as the action of filling the tank with fuel will dilute and disperse the premix adequately throughout the fuel in the tank. So it really is simple to use. So how much should Royal Purple or Idemitsu Premix should I add ? In the case of an RX-8 on the street many of our customers add 120-150ml of Royal Purple 2 Cycle oil per tank of fuel (approx 55-60 litres of petrol) This is roughly a ratio of 360:1 (360 parts fuel to 1 part 2 cycle oil) ratio is what we use here at Essex Rotary on our own cars. When we take it to the track then we will increase this mix ratio as high as 160:1 this converts to about 350ml per tank of fuel. These mix ratios should also be good for the older generations of the rotary engine however you will need to use the mix ratios combined with your fuel tank capacity to work out your correct dose of 2T oil. I am considering using Premix how often should I use it? Hopefully by now you should have enough information to decide if you feel premix is right for you. One of the questions we get asked is how often should it be used. Ideally every fill up, if you really want the benefits that premix can offer you and your rotary engine then yes you really want to be putting the correct amount in the tank every time you fill up, This is what we recommend. Some ask if it is acceptable to use ever other tank of maybe every third tank. In reality some additional protection every other tank for example is better than none at all so by all means do this. But if you are looking at premixing on occasions and not on other as a way to save money on the additional price of a fill up at the fuel station then just remember a single bottle multiple tanks of fuel and when broken down the small additional cost for a shot of premix in your fuel normally works out at less than you would think. If you decide to start premixing then please only really consider high quality 2T (2 Cycle) Synthetic Oil for your premixing application. As Synthetic 2T is designed to burn leaving minimal deposits in the combustion chambers. It really is a false economy to go select your premix primarily on price grounds over quality. If you have any further questions about premixing, or you wish to start treating you engine to some of Royal Purples finest and want to know more then please get in touch and the Essex Rotary team will be glad to help.